On Tuesday morning one of my kids had a doctor appointment at 8:30, with check-in time 15 minutes prior. Despite the inevitable “poop-the-diaper-moments-before-it’s-time-to-leave” efforts of my baby (yes, I changed it before we left), we were approaching the clinic right on time. Except for one thing. Parking. 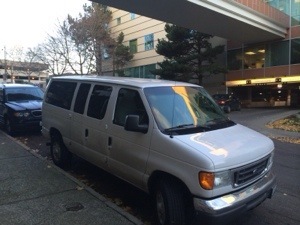 Since we have six kids we ditched our minivan and roll with a white 12-passenger (former airport shuttle) van. Or the “creeper van” as my kids call it. Whatever you call it, it’s a beast to park since it’s taller than most underground parking structures, this clinic included. That leaves street parking as the only viable option. And most of those spots are snatched much earlier by the clinic staff. When we were about 5 minutes into the 15 minute drive to the clinic I said a quick and informal prayer asking God to provide us a close parking space so that we could be on time. It’s a habit I formed several years ago after a pastor challenged us to do so in a sermon about inviting God into our everyday, mundane part of life. Over the years my kids have heard me pray it aloud and have seen it work effectively, to their amazement. It’s also provided an opportunity to discuss the importance and role of faith and prayer in my life. I suppose it’s another perk of being a stay-at-home-dad; living out my faith in the nuts and bolts of life with my kids. When we were about to turn the corner by the clinic I uttered a slightly more urgent version of my parking request, finishing it with a slight challenge. “Ok, God. Do your thing.” I meant no disrespect by it. But I probably should’ve worded it differently. After all, I’ve lived long enough to see that God has a sense of humor. Thankfully, God also has a sense of compassion. My challenge to God had barely left my lips when I saw the red brake lights and white reverse lights illuminate on a car parked in one of the three spots closest to the clinic entrance. In our family we call that “rockstar parking”. As I waited for the car to pull out I humbly thanked Him for such a swift and obvious answer to my request. My three year old told me that our van wouldn’t fit between the parked cars. She had no need to worry as I parallel parked the beast like a rockstar…no prayer needed! I hope that sharing this incident encourages and challenges you to invite God to help you in the boring things of life to help build not only your faith but also that of your children. Please don’t think of me as a saint or anything like that. I mess up many times each day. Sadly, it’s more than enough to live out the concepts of mercy, grace and forgiveness before my family. Let me know if you take up the parking challenge. I’d love to read about your experience. Greetings! I’m Heather and I was wondering if you could answer a question about your blog! If you could email me at Lifesabanquet1(at)gmail(dot)com that would be great!